Super Star Rajinikanth’s fans got super excited when the news of their hero teaming up with star director Murugadoss came out. When the makers released first look poster and also the powerful title Darbar for the project, they went over the moon. The film’s shooting is progressing in Mumbai where Rajini is romancing Nayanthara in the exotic locations. Nivetha Thomas is playing an important role as Rajinikanth daughter. 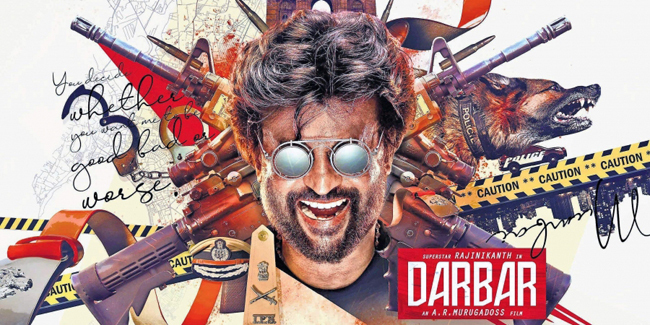 In the midst of all this, it is coming out that Darbar poster is the copy paste of Hollywood action entertainer Killing Gunther starring Arnold Schwarzenegger. Now many are left wondering whether the makers copy pasted only the poster or they are indulging in the freemake of entire story. Rajini is rumored to be playing dual roles one as a powerful police officer and speculation is on about his second role. Some say he will be seen as a politician or as the CM of Tamil Nadu, while others say Rajini will be seen as a social activist.